Last night began our fall schedule. Football, football, and some more football! We love it. But like I said yesterday, Moma has to have her ducks in a row to get it all done. While we were out yesterday picking up the last of the boys gear, I saw tons of sports drinks. Looking at their ingredient list, I lamented over the thought of buying them. Not that we won't end up having some at some point this season... I am not that naive, but if I can be prepped and ready, hopefully we can avoid some of the stuff that you can be persuaded to at ballgames. Why go to the trouble of making them? Well, I am not a fan of soy, high fructose corn syrup, or any of the ingredients that I can't pronounce. I also feel that so much is added just so they can preserve the food for the shelf. I'm here, I can make it up several times a week if need be. With very little ingredients! I don't necessarily have to preserve anything on my list today, and we will all be the better for it. And lastly... Energy bars and sports drinks are CRAZY expensive! I mean, really expensive. So, it is a no brainer for me. We do what we can with what we have and try to be prepared and not spend any extras if we can help it. There. You can call us cheap if you need to... I prefer to say we are practicing frugality and good stewardship. 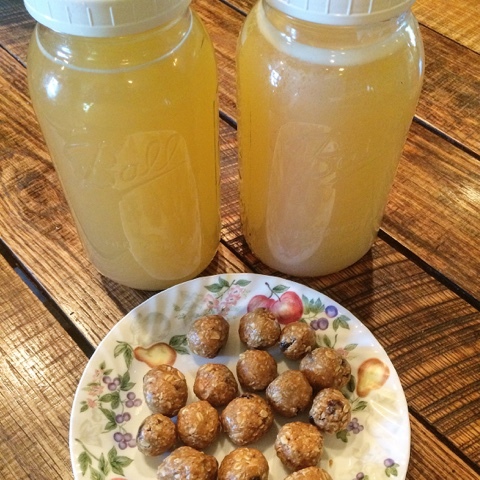 So, I have some energy bites and some homemade 'sports drink'. Mix well, roll into balls and pop into the fridge. These little bites are very tasty. But they are jam packed loaded with fuel, and they are approximately 100 calories a pop. So be aware that you don't load yourself up with too much. I gave each of the boys a couple of these before practice. And then they are stored in the cooler so they can have one after practice if they need something. Fill with water and shake and chill. This is for helping to replenish your body. It will taste BEST if you are hot and thirsty.